Do you want your blog to reach over 1 million visitors? Over 1 million unique visitors come to Beat The GMAT each year. Would you like to share your blog posts with all these business school applicants, MBA students and experts? If yes, then join the Beat The GMAT Blog Network! When you join the Beat The GMAT Blog Network, we will promote your blog posts across our entire website, which is one of the most active GMAT/MBA sites in the world. We have tons of community members who are constantly trying to learn from other people's experiences and perspectives. By joining our network, you will get maximum exposure for your blog and help a lot of students as well. Beat The GMAT is the single largest source of traffic to my website. I can't believe all the exposure I'm getting by being a part of this Blog Network! Hari K, Author of Memoirs of an MBA Applicant The Beat The GMAT Blog Network has supercharged the traffic to my website. What an awesome service by Beat The GMAT! I recommend all GMAT/MBA bloggers to join this network! Add this badge to your blog by copying and pasting the code below. If you have a Blogspot blog, then click here to learn how to add the badge to your blog. If you have a WordPress blog, then click here to learn how to add the badge to your blog. Step 2: Let us Know You're Ready to Join the Network! 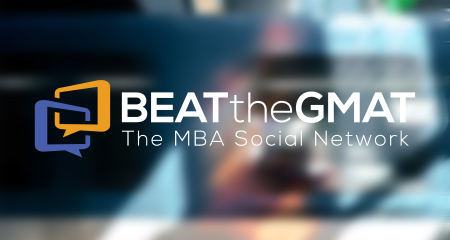 After adding the badge from Step 1 to your blog, let us know that you're ready to join the Beat The GMAT Blog Network by filling out the form below. Once we have verified that the badge is on your blog, we will start featuring your articles throughout our entire site.